We are lucky to live in a time and in a town that has a tremendous selection of ways to nourish your cat. Food is the absolute cornerstone of health, for us and for our cats. Many foods will allow your cat to survive, but the quality and types of ingredients and the amount of processing a food goes through both matter quite a bit, and these factors can often be the difference between surviving and thriving. Most people automatically pick up a kibble for their new cat, but we’d like to let you know that there are other options as well. Kibble is of course very convenient, and kitties like it a lot. In our opinion, kibble has come a long way in the past 10 years or so and some are very much better than others (later in this article, we’ll tell you how to identify the good from the bad). However, this is still a highly processed form of food, and as many people realize that for our own health, the less processed food and the more whole food in our diets, the better. The greater problems with kibble for cats are that many are too heavy in carbohydrates for cats, and also that kibble is so moisture deficient. Meat and Moisture are the two cornerstones of good nutrition for cats. There are some great moisture-rich cans and excellent commercially prepared diets made with fresh minimally processed foods on our shelves and freezers, and we encourage you to try to integrate them, at least in part, to your cat’s diet. (You could of course make their food. Though we realize that not everyone has the time or inclination to make their cat’s diets, if you want to, check out www.catinfo.org, written by a vet and has lots of tips and instruction). Regardless of how you provide it, we’d like to tell you why meat and moisture are such valuable options to the health of cats. First, cats are obligate carnivores, and are designed inside exactly like their wild counterparts. The term “obligate carnivores” means that unlike coyotes or dogs that can be more opportunistic and take advantage of many different varieties of foods that they find, scavenge or hunt, house cats (and tigers and leopards) are specifically designed to eat a diet made up of fresh meat, bone, organs and the moisture that accompanies them. Recently, a team of researchers sequenced the genes of several species of large cats, and found that the common house cat shares 95% of its DNA with Siberian Tigers. In her discussion of this study, Dr. Karen Becker, DVM says, “In big cats, several genes are altered in the metabolic pathways linked to protein digestion and metabolism. Those adaptations, which evolved over tens of millions of years, are thought to be what allows felines, as obligate carnivores, to digest and live solely on a diet of animal meat.” Unlike many other species, cats cannot manufacture certain amino acids in their bodies that are critical to their survival (ie: Taurine), and instead must get them from their foods. These amino acids are only found in meat proteins, hence the term, “obligate carnivore”. Carbohydrates: Cats were not designed by Mother Nature to make very good use of plant based proteins, as they lack specific metabolic (enzymatic) pathways that would allow them to use plant proteins efficiently. A diet low in quality meat proteins contributes to many chronic illnesses in cats. In fact, studies have shown a strong link between high carb diets and urinary tract disease. In a discussion of feline heart disease, Dr Karen Becker, DVM says, “I firmly believe the unnecessary carbohydrates found in most cats foods offsets the amount of protein cats need, making carbs a significant nutritional contributing factor to feline heart disease. The amount of taurine, carnitine and CoQ10 found naturally in unprocessed meat is critically important to feline heart health. In my opinion, these vital nutrients are not found in adequate quantities in most dry foods, and processing further diminishes their bioavailability. This is another reason I recommend starch free foods (no grains or potatoes) for cats.” All kibbles must contain some amount of starchy carbs to hold it together to make those little crunchy bites. There are definitely some better kibbles, meaning some that are meatier with fewer carbs than others. “Grocery store” kibbles are especially inappropriate for cats, as almost all of the protein in these foods is derived from plants like corn and wheat (as they are far less expensive than animal based proteins), with some meaty flavorings and some meat by-products. Corn is an extremely high glycemic food – each time they eat it their blood sugar spikes, and a lifetime of this sort of food could lead to diabetes. Carbs also create weight gain for cats instead of energy – a grain free diet will keep them leaner and more satiated with a smaller amount of food. When shopping for cat foods, look for foods that are grain free. Another very critical component of cat food is moisture. In fact, if there’s one single aspect we would identify as most important in cat food to help avoid many common chronic illnesses of the urinary tract and kidneys, it would be moisture content. Cats have not had to evolve a very strong thirst drive, as their natural prey contains quite a bit of moisture. In fact, many carnivores in nature derive most or all of their moisture from the prey that they eat. A mouse or a bird is about 75% moisture, similar to the moisture content of canned and raw foods. Cats on dry foods will appear to drink more water than cats on cans or raw, but if you add the amount of moisture in a kibble (about 10%) to the amount they drink, they still are usually consuming only about 1/2 of the moisture they would be getting from a moisture rich diet. This can lead to a state of chronic low-level dehydration, which over a lifetime can lead to stress on the kidneys. We have so many customers whose cats have kidney problems that we’ve actually had to come up with a special system in our food room to make it easier for owners to shop for foods appropriate for feeding to kidney-compromised cats. A lack of moisture also causes the urine to concentrate, which can lead to crystals in the urine “clumping” together, causing dangerous and painful blockages. Kidney and urinary tract problems are so incredibly common in adult cats that we believe that a moisture rich diet is very important. Studies back this up, showing that a moisture rich diet results in fewer urinary tract issues for cats. Certain dry diets designed to manage urinary tract problems are often higher in carbs, contain added acidifiers, as well as added salt to stimulate more drinking. We feel that an easier and more natural strategy could be to feed a grain free canned or raw diet, as meat is naturally acidifying, and the moisture is already integrated into the diet. Tip for getting your cats to drink more: Put water somewhere away from where their food is. Whether it’s a human drinking glass on the floor of the dining room, a fountain in the living room, or a bowl on the bathroom vanity, cats drink best when there is additional water somewhere novel in the house. It is sometimes a remarkable improvement in the amount of water consumed! This is a great tip for kitties that refuse anything but kibble, but all cats can benefit from a bit more water. Try to use glass, ceramic, or stainless bowls for water. “Biologic value” refers to how digestible and nutritionally complete a food is for the species that eats it. The closer a food is to what that species has evolved to eat, the easier it is for them to make use of it. Meat would have a very low biologic value for a horse, and even if it had lots of alfalfa flavoring and vitamins that horses need, one could understand that this sort of diet would at least be difficult for a horse to digest and would almost certainly cause chronic problems. A somewhat similar analogy can be drawn with feeding carnivores a diet made primarily of plant proteins, with meat flavors and a few critical amino acids added back. Think of every nutrient that is in whole foods, from the many amino acids found in meats, the enzymes the animal uses to digest them, the vitamins, minerals, etc. all as puzzle pieces, each with important roles to play in the health of the animals eating them. The more we cook and process foods, the more puzzle pieces are damaged or destroyed, and toxins can also be created in the process (Google “Acrylamide” for an example). Some puzzle pieces are deemed to be so critical to survival that they must be replaced (like the amino acid Taurine for cats), but others, even though they are in fact important to their long term health, are not necessarily replaced. Remember that AAFCO (the organization that is responsible for overseeing pet food ingredients) creates guidelines that represent the minimum standards to sustain life and body weight (which are of course important), but not necessarily more than that, and has no guidelines as to the quality or bioavailability of the ingredients. In fact AAFCO disallows statements of the quality/grade of ingredients on the label, so it’s up to us as pet parents to look for ingredients that are the most appropriate for the animals we’re feeding. This is the reason that we love commercially made raw foods for cats. If you think of what the many millions of feral cats eat when they are not fed by humans – they default to their ancestral diet – one made of meat, bone, organs, and moisture, complete with enzymes, a wide range of amino acids, and without unnecessary carbohydrates and heat processing. There are many prepared foods on the market that provide interesting, safe and convenient ways to give whole food, species-appropriate nutrition as some or all of your cat’s diet. These including dehydrated or freeze dried foods that you reconstitute with water, and commercially prepared balanced raw food meals in the freezers. Over and over we see chronic health issues improved or resolved with a diet made from whole, minimally processed foods, so it stands to reason that these diets could have prevented these problems to begin with, extending lives and saving tons of money at the vet. These types of foods don’t have to be an all or nothing proposition – some people feed raw food in the morning and kibble at night, or they sneak a little raw food in by mixing it in with some of their canned food. Incorporating even one ounce of raw per day to their regular diet in this way could be considered a fantastic whole food supplement (a 3# bag contains 48 one ounce frozen nuggets and costs something like $16.99 – that’s cheaper than any synthetic vitamin supplement on the market!). In fact, feeding raw food is sometimes cheaper than feeding canned foods. Be very patient. Be open to experimenting. If you’re willing to be patient enough and creative, you will almost certainly be successful. Go very slowly. Sneaking a tiny amount of something new into a favorite food can help them acclimate to a new flavor. Introducing a new food slowly also helps avoid digestive distress a sudden change could create. The most important thing to remember is that it can be dangerous for cats to go more than a day without eating, as they are prone to a serious liver problem when they fast for too long. Being hungry at mealtimes is perfectly OK, but they shouldn’t skip eating altogether if they refuse what you give them. That being said, picking up their food between meals is a great way to make sure they eat better at mealtime, helps to control their weight, and lets their digestive system rest between feedings. Feral and wild cats must find, hunt and then eat their food, and then they relax and digest it before starting the process again. Cats are very sensitive to changes in smells and textures. Some may love a new food right away, but some cats may take some creativity on your part to help them through the transition. Kibble can be a very addictive food for cats, so if you’re trying to transition to a wet or raw food, sometimes putting their kibble in the food processor to make a powder that you can sprinkle onto the top of a wet food can provide them with a familiar taste and smell. This is also a great trick for trying to get cats off of a very addictive grocery store kibble, which can be filled with artificial flavorizers: put the grocery store food in the food processor and “shake and bake” the new food with it! Put some of your new kibble in a ziplock, add the powdered grocery store kibble, and shake it around to coat the new food with the old flavor (or add it right to the bag of new food and shake well). Raw foods are sometimes immediately accepted by some cats, but many cats are thrown off by its lack of fragrance. If you think about it, a raw chicken breast doesn’t (and shouldn’t) smell like much of anything to our nose (but when you cook it, it smells fragrant), and if you consider how fragrant a can of cat food can be, you can understand why they might think that you have just put something inedible down in front of them. For these cats, sneaking a little bit of raw into a favorite canned food can trick them into trying it, and they can acclimate to the flavor as you increase the amount slowly. Freeze dried meat treats can be very useful to provide extra flavor. Most freeze dried meats can be easily crushed with your fingers into a powder and sprinkled on top of anything they’re unenthusiastic about. They come in many flavors like salmon, liver, chicken breast, etc. Even if they’re marketed for dogs, if it’s just a freeze dried meat with no other ingredients, it’s perfectly appropriate for cats. The water from a can of tuna can be useful, as well as chicken or turkey baby food. (These things are also useful tools for older cats who might lose their appetite due to chronic illness). Integrate some variety in the early days. Cats are what we call “imprint feeders”, meaning that they become very loyal (and sometimes painfully exclusive) to what they were fed as a kitten. If you only feed one type of food, it can be very difficult later if you want to change it. If a cat has only eaten dry food and you need to get medicines or supplements into them later, it’s difficult to mix them into food if they won’t eat wet food. If you feed cans, try using a good quality kibble as an occasional treat, or if you feed dry, reward them for a nail trim with a little canned food. Exposing them to real foods like small pieces of chicken is great for rewards for handling/nail trims/brushing, etc but be careful about feeding any animal from the table for behavioral reasons. Choose feeding times and stick with them. Cats become good at begging for food if they are rewarded by food when they beg for it! If they know when feeding time is and when it is not, they are less likely to bug you at other times. It’s worth noting that kittens eat quite a bit more than adult cats do for their size. Choose a food that says it is approved for all life stages of cat, and check the feeding guidelines for their weight and age, but feed less if your kitten’s getting pudgy or more if his hip bones are visible. In 2013, the Association for Pet Obesity Prevention (APOP) reports that almost 60 percent of U.S. cats are overweight or obese. Viewed from above and from the side, a waistline should be visible. Feeling his ribs should be easy to do – if you have to dig for them to feel them, your kitty is getting too fat. Keeping a cat lean is an excellent thing to do to help avoid chronic illness and to keep his energy level high. Though we’ve said here that we prefer wet foods to dry, we do realize that some cats might not be able to be convinced to switch. We also realize that kibble can sometimes be a more economical and convenient way to feed. Because of this, we’ve tried to stock the very best kibbles on the market, made with human grade ingredients and verified safe manufacturing processes. Some even have some freeze-dried raw ingredients applied after cooking, or are made without the use of synthetic vitamins and minerals. Avoid By-products and any meats or fats that don’t specify the species used. For example, you want it to say “Chicken Meal” or “Herring Oil” and not “Meat and Bone Meal” or “Animal Fat”. These are the ugliest ingredients in the pet food industry. According to the FDA, ingredients like “Meat and Bone Meal”, “Animal Fat” and “Animal Digest” are the most likely to contain euthanized animals and 4D meats (dead, dying, disabled or diseased) and the drugs that were used to euthanize animals can be detected as well when tests are done. Avoid artificial colors (ie: yellow #5) and chemical preservatives (ie: BHA, BHT, and ethoxyquin which are banned in other countries for their carcinogenic properties). Avoid extremely grain-heavy foods, especially those with wheat, corn, and soy. Not only are these allergenic for some cats, they are simply a less expensive source of protein than higher quality meat proteins, necessary for cats to thrive. Grains like corn are very prone to dangerous, toxic grain molds like aflatoxin. Corn, soy, and beet pulp are also likely to be GMO, so could have pesticide residues. Corn is a very high-glycemic food as well. High carb foods are the fastest way to put weight on your cat, and grains are high in phytic acid, which inhibits mineral absorption, possibly causing tooth and bone problems. Occasionally Rotate your foods. Don’t get in a rut where you feed the same brand and flavor for years and years. Think about it this way: no matter how much thought and care we might put into it, we couldn’t create a single plate of food for ourselves that would provide every nutrient we could possibly need, so that we could eat it for every meal of every day of our lives. It makes sense that doing this might eventually create a deficiency in something we need, or a nutritional excess in something that we’re eating that isn’t well suited to us. Each protein has a unique combination of amino acids, and each brand of food has chosen a different mix of fruits, veggies, fats, etc. Rotation allows for a greater variety and balance of nutrients over time. We also see pets that have developed an intolerance to certain proteins from eating the same one for many years – their bodies just start to reject it, reacting to it as if it’s an allergen. Occasionally rotating to different proteins within a brand helps to prevent this. Then, occasionally also rotating brands allows you to provide a different variety of nutrients. Pets that never rotate are the ones that have the most difficulty (digestively) changing foods, so occasional rotation helps to avoid this. Always try to blend when you switch foods to avoid digestive upset (though cats may just pick out what they like if they can!). Rotation also allows you to observe changes in your cat’s appearance and vitality as you try a new protein or a new formula – every cat is different, and trying new things allows you to see what suits your individual cat. Some vets worry that people who change foods a lot won’t be able to identify what might be causing a problem for your cat if he has one, and for this reason we encourage you to make only one change at a time, blend between old food and new, and stay on a new formula for a few months to make sure it suits your cat before introducing another one. Always return something that isn’t working for your cat. Some brands have frequent buyer cards or we have computer records which help you to track what you’ve been feeding and how long it takes you to go through it. If you think there is any chance that there is something wrong with a food you are feeding, always at least report it to the company and also to the store you bought it from. If you feel sure that a food has made an animal sick, report it to the FDA Always keep the packaging for a few days on any food, so that if you need to report it, the lot # will be available. These efforts can help to protect other pets from safety problems as well as helping the store to notice patterns in returns that could indicate safety/manufacturing problems. Myth – Kibble cleans teeth – First, cats and dogs are carnivores; their teeth are not designed for chewing or grinding like ours are, they’re designed to shear through meat, bone and organs like scissors. The best they’ll do is crack a kibble and swallow it, which does not clean the teeth. Even for ourselves, no matter how crunchy something was that we could eat, it wouldn’t clean our teeth either. Furthermore, the starches in kibbles can adhere to the teeth and cause tartar. Raw food, on the other hand, contains enzymes that help to control bacteria in the mouth, doesn’t require starchy binders like kibble does, and doesn’t adhere to the teeth as much as kibbles and cans do. Myth – You should never feed your cat “human food”– True, some foods like pasta and Doritos would be inappropriate to feed your cat, but things like cooked chicken or other small pieces of meat are just better whole food versions of things that are already used in pet foods, and nothing magical happens to these ingredients when made into pet foods to make them more appropriate for cats. There of course could be behavioral problems that can occur if people are feeding these foods from the table or rewarding begging, but nutritionally speaking, whole foods make great training treats and food toppers. Note: when adding whole foods to a balanced diet, they shouldn’t make up more than 20% of the total amount fed without needing to discuss how to make them more balanced, and one should always consider portion sizes/calories when additions are made. When feeding a quality diet, you generally will have little need for supplements, but there are a few things that help to maintain good health, especially for kittens. Probiotics and digestive enzymes: Just like in humans, 70% or so of a pet’s immune system is generated in the lining of the gut. The good bacteria in the gut does a lot of work including fighting bad bacterias. The good flora in the gut is easily damaged by antibiotics, steroids, over-vaccination, toxins in our environment, stress, etc. Supplementing with probiotics is important to support healthy gut function and a strong immune system. This is especially important for kittens – they’re encountering many stresses and challenges to their immature immune system with vaccines and even the normal stresses of their world changing for them so drastically from baby to adolescent. Enzymes (normally supplied by fresh foods but destroyed by cooking) help to break down foods into the nutrients their bodies need, and supplementing enzymes can ease the burden on the pancreas. Omega 3s – Fatty acids like the Omega 3’s found in fish oil provide many benefits to the body. They not only support the maintenance of healthy skin and coat, but studies on puppies have shown that those fed a diet higher in DHA (found in fish oils) improved cognitive, memory, psychomotor (movement, coordination and dexterity), immunologic and retinal (vision) functions in growing dogs. Cats would of course receive similar benefits. As cats age, these fatty acids also help to fight inflammation in the body and support joint health. A good rule of thumb with all supplements is to always only introduce one new thing into a cat’s life at a time, at a smaller dose than is recommended on the label. Your cat might be one of the rare cats that has a problem with a specific ingredient, and you can’t “un-give” something if they start to show a sensitivity to it. Introducing every new thing slowly and building up to the recommended dose prevents digestive surprises as well. Holistic vet, Dr. Karen Becker, says “a digestive tract compromised by an inflammatory condition like inflammatory bowel disease (IBD), parasites, foreign objects, cancer, or another serious disorder may not be able to process even normal amounts of hair. A chronic hairball problem should be investigated by your veterinarian, since there could be an underlying disease requiring treatment. 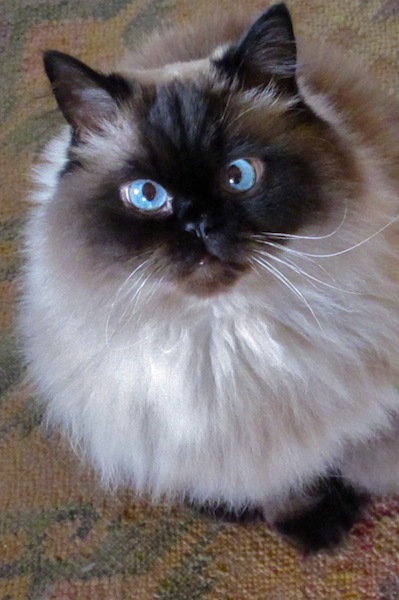 Remember: chronic vomiting in a cat – even a long-haired one – is not normal. It’s important to identify the root cause of your kitty’s digestive dysfunction and work with your holistic vet to resolve it, and sooner rather than later. This will help prevent more serious GI issues down the road, like IBD, which in cats is linked to lymphoma”. We took in a 1 or 2 year old cat that Christine had rescued – someone had dumped her at the zoo where Christine worked as a keeper and the poor thing was starving to death. She was well loved, but after a lifetime of Iams and Science Diet kibbles, she was overweight with bad teeth and a big problem with puking up her food right after she had eaten. We tried Science Diet Sensitive Stomach, then Hairball Formula to no avail. We thought that she was eating too quickly and tried to feed her more and more slowly, but she threw up every day. Christine was teaching puppy classes at a big box store when another employee interested in nutrition mentioned that though different brands might cost the same, not every company spends the same amount of that cost on ingredients vs. marketing. She pointed out that a food label might say “corn” or “chicken”, but that one company might spend $300 a ton on corn or be using chicken muscle meat, and another might spend $30 a ton or be using largely chicken skin and bones instead of the meat, but that on the the label a company is only allowed to state “corn” or “chicken” and the customer won’t be able to tell the difference in the quality of the ingredient. When Zoe started eating other brands, her vomiting slowed down. Christine and Mike were instantly hooked on learning more. Zoe’s blood work showed some trouble in her liver values, which can reflect a poor diet and contribute to vomiting issues. 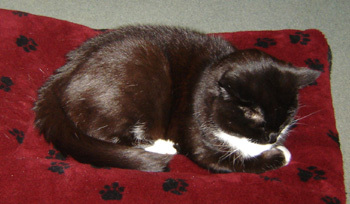 As her kibble diet continued to improve, the vomiting got far better (every week or two) but didn’t resolve. By age 17 or so, she had developed early stage kidney disease, and our new holistic vet recommended integrating cans that were low in phosphorus. We thought she could be qualified as doing “well” for her age and her conditions, but she still looked old, and her liver and kidney values were still off. She was 18 before she agreed to eat raw food. We tried it because she was aging so quickly, and we suspected that we wouldn’t have her for too much longer. She felt bony under her coat, the way many old kitties feel, as she had lost a lot of her muscle mass, especially noticeable in her hind legs and hips. She had a hard lump on her arm. She was a black and white cat but her coat looked brownish, and it looked greasy and dry at the same time, separating when she moved and she shed a lot. We attributed all of these things to age, not being able to groom herself as well due to stiffness, etc. It took a great deal of creativity, sneaking tiny amounts into her canned food and topping it with crumbled freeze dried meat treats or her favorite kibble ground in the food processor and sprinkled on top. It was challenging because her appetite was poor. But she started to acclimate to the changes, and what we saw was amazing. Within 2 weeks she was black again and her coat was shiny and sleek again. No joke. This was a big lesson to us to learn that cooking can damage or destroy amino acids that have important roles to play in the body, but might not be supplemented back by the food company if their absence does not mean death in the short term, like in the case of Taurine. That her coat changes were not due to “age”, but were a sign of a nutritional deficiency. Within 2 months her muscle mass had largely returned, and she felt like a cat again when you pet her. She could jump into her favorite window again, which she hadn’t been able to do for a while. Less than a year later, her liver values were normal, her kidney values had improved (we can never fully heal damaged kidneys, but we can certainly improve the values and support their function), and she no longer had that hard lump on her arm. She almost never vomited in her later years, and she lived to be about 22. She looked more beautiful at 20 (photo below) than she ever had at 7 or 8 years old. This pattern has repeated with customers over the years, with seemingly ancient cats given new life. We’ve seen bowel problems resolved, vomiting clear up, muscle mass restored, and stories like this are absolutely why we have this store. We wish we had maintained Zoe’s teeth (she never had a dental and wound up with very bad, certainly painful gum disease) and that we had known more about cat nutrition earlier in her life, as we wonder how much longer and better she would have lived. We can’t know that, but we are certain that all living things can stay healthier when nourished properly. We’ve learned that food is powerful medicine, that whole foods are better than processed foods, that not all chronic illness is inevitable, and supporting good health is so much easier than reversing illness. We believe that our goal should be to do the best that we can to support the health of our beloved pets through the power of good nutrition. Being cat lovers, we certainly realize that cats have a unique ability to decimate your best intentions with their occasional inflexibility. They are slaves to routine, and changing any part of it can be difficult, to say the least. Often patience and persistence will provide you with a positive outcome, but we know that sometimes you must compromise, and perhaps try again soon. We also realize that not everyone can afford to do the very best things for their kitties. This does not make them bad people, and it doesn’t mean they aren’t devoted to their cats. We simply hope that with more information, you will be able to choose the best food you can afford. Sometimes better alternatives are available for the same price point, if you know what to look for. Chronic illnesses are time consuming, can be very expensive, and can be emotionally draining for their owners. We truly hope that this article can help you to make good choices and inspire you to persist through pickiness to maintain better health and keep them with you as long as you possibly can. Please ask us questions if you have them! www.catinfo.org – a fantastic website written by a veterinarian, with articles about specific common health concerns, diet tips, instructions for making your own cat food, and additional tips for switching foods for picky cats. See the foods we carry at Green Dog here for suggestions on brands to look for. Great article. I follow your guidelines, but it is nice to have affirmation. I experienced my 10 year having kidney difficulties and it was frustrating, and I tried researching all foods and was zeroed in on the phophorous levels. Not all foods list them. Do you have list of canned foods that have low ash and phosphorous? Hello – if you’re local, you can come in – we have the shelves marked with green stickers for our lowest phosphorus cans (1.0 or lower on a dry matter basis) and yellow stickers for moderate amounts (1.0-1.2). If you’re not local, email Christine at info@greendogpetsupply.com and I’ll give you a list of some of the lowest. In speaking with Mike just now via that ancient of instrument, the telephone, I suggested a workshop to teach your customers how to best prepare a home-made diet for our cats. I would definitely attend, as would many of my neighbors and friends in the PDX cat community (those who provide shelter & nutrition to lost & abandoned kitties), as we want to do our absolute best for them. Please consider providing such a workshop. There’s a lot of data out there, but hands-on experience cements the knowledge and makes it usable. Thanks for calling and writing! I’ve tried to do this several times with almost no audience each time (one of my challenges is that the lecture takes at least an hour and there’s nowhere to sit at the store, so I tried to do it at New Seasons – they have a regular lecture series that they publicize and have good rooms for this. Even though I also tried to publicize them in my newsletter, in the store, and on Facebook, etc. I only had one or two people at each one). Perhaps we can chat at the store together and think of solutions. What is your take on fruits and vegetables being added, they are plant based and have carbs?